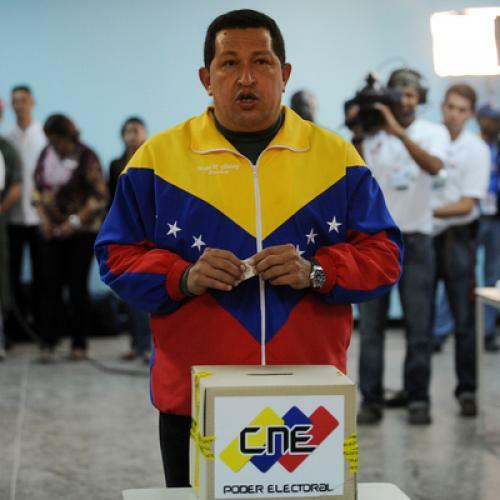 In 1998, Hugo Chávez ran for the Venezuelan presidency on a promise to “re-found” the republic. His pitch to the nation stressed a particular understanding of popular sovereignty. Sovereignty, Chávez stressed repeatedly in his legendarily long-winded speeches, belongs to the people, who place it temporarily in the trust of a particular set of governing institutions. The people can, by the same token, take it back at any time and exercise it directly, by means of the vote. In this pop-Rousseauian interpretation, the people’s will is the point of origin of the government’s legitimacy and so has to be considered “supra-constitutional.” In Chavista constitutional doctrine, when the set of state institutions that the people have constituted no longer fits the people’s needs, they are free to dissolve those institutions. What matters is who embodies “the people”; and Chavez is of course certain that he does. His Rousseauist doctrine became the intellectual launching point for an aggressive constitution-making process in Venezuela in 1999. Then vastly popular, Chávez used it to legitimize a National Constituent Assembly in which his partisans held 94 percent of the seats despite winning just 65 percent of the vote. The assembly, in short order, made sure that Chávez himself could directly or indirectly appoint all state officers who would theoretically be charged with checking and balancing his power. It hardly takes a constitutional scholar to realize the dangers implicit in such a sweeping view of popular power. Picking up this book by the noted Venezuelan constitutional scholar Allan Brewer-Carías, I expected an in-depth dissection of this debate from an unapologetically conservative standpoint. Long considered one of Venezuela's leading constitutional scholars, Brewer-Carías would more than likely be a leading member of Venezuela’s Supreme Court if Chávez had not come to power. A former minister with teaching stints at Cambridge and Columbia, Brewer-Carías is the epitome of a Venezuelan ancien régime grandee. Imagine my surprise, then, upon realizing that the book’s long discussion of the constitution-making process of 1999 never stops to discuss the idea of supra-constitutionality at all. Instead Brewer-Carías’s remarkably ill-tempered screed merely repeats, time and again, that the mechanism Chávez chose to re-write the constitution was not contemplated in the constitution of 1961. The absence of any clear acknowledgment of supra-constitutionality as a coherent and flawed constitutional doctrine will render large swathes of this book simply unintelligible to much of its intended audience: it is a long, detailed rebuttal to an argument that the reader has never heard. What should have been a brutal dissection of Chávez’s authoritarian impulses and muddy constitutional vision instead reads like a thin and pointless polemic. The heroic liberals and democrats who oppose Chávez deserve better than this book. Brewer-Carías zips cheerily from an analysis of the constitution-making process of 1999 to a discussion of its implications in 2004 and beyond, entirely eliding the whole political crisis of 2002 and 2003 and, more specifically, his own role in the comedy of errors that had President Chávez unconstitutionally overthrown and imprisoned for forty-seven hours, only to be brought back by loyalist army units. Though he has steadfastly denied any direct participation in the failed coup, Brewer-Carías can hardly deny that the preamble to the statutes that would have constituted the new “transitional” government was almost identical to a document of his authorship, which circulated around Caracas days earlier. Eyewitnesses spotted his distinct Dalí moustache on the fifth floor of the Venezuelan Army Command Building in the pivotal early morning of April 12, 2002—suggesting that, however deep or shallow it may have been, Dr. Brewer-Carías had a clear part in decision-making at the critical moment. On this, though, as on the question of supra-constitutionality, his book is careful to elide every interesting question. Perhaps Dismantling Democracy in Venezuela should be read not as constitutional analysis, but rather as a kind of archaeology of an entire displaced elite’s wounded sense of entitlement. Chávez has unfortunately been lucky in his opposition. Used to being treated with deference, the old guard could never reconcile itself with the legitimacy of a government that refused to even pay lip service to its predecessors. Instead, between 2002 and 2005, it happily played along with Chávez’s polarization strategy, embarking on an escalating series of adventures of questionable democratic legitimacy to try to dislodge him from power: first, the 2002 coup, then a bizarre walkout by dissident military brass, followed by a two-month long oil sector strike that cost the nation tens of billions and hugely disrupted livelihoods. The anti-Chávez movement emerged weaker from each of these maximalist gambits, thus ceding more and more institutional space to Chavismo. Meanwhile they generally derided the people who supported him, alienating the kinds of everyday working Venezuelans whom the opposition most needed to win over. It was easy to see that the kind of reactionary politics that the old guard was intent on pursuing would rebound to Chávez’s advantage every single time—which helps explain why Chávez seemed so intent for so long on keeping his most reactionary critics front-and-center. For much of the last twelve years, Chavez has found it easy to justify his illiberal and criminal governing style by holding out the prospect of the return to power of some of the more reactionary elements within the opposition. Those of us who have opposed him on liberal grounds from the start—and there are far more of us than the standard narrative would suggest—have been weighed down for years with association with ancien régime dinosaurs of the type that Allan Brewer-Carías has come to represent and to support. Indeed, it has taken the Venezuelan opposition the better part of twelve years to begin to leave behind its reputation as a gang of out-of-touch plutocrats. A new generation of younger leaders largely free of association with the old system has slowly come to the fore. In regional elections in 2008, opposition leaders from this new generation won governorships in Venezuela’s two most populous states, as well as the race to be mayor of Venezuela’s largest slum. In September this year, dozens of new generation opposition leaders won election to Venezuela’s National Assembly, in a vote that saw anti-Chávez parties take 52 percent of the national popular vote. This younger crop of leaders have cut their political teeth organizing at the grassroots, doing the kind of community work that was once associated with Chávez. But their ability to challenge Chávez for power remains hobbled by the inevitable need to reach some kind of pragmatic accommodation with figures of the old regime. As the Chávez movement founders on the shoals of its own incompetence and hubris, Venezuelans now more than ever need a movement able to act as a vehicle for the dashed dreams of the majorities that once supported Chávez. There are times when it is easy to conclude that the biggest obstacle in the path of the Venezuelan opposition is its own credibility, or lack of it. It is absolutely imperative that Chávez be opposed by people who hold the liberal values that he himself has so disgracefully trampled upon.